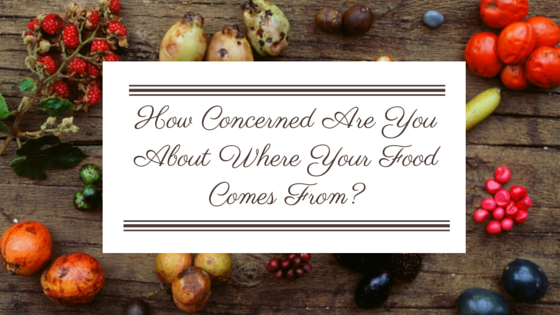 Essay: How Concerned Are You About Where Your Food Comes From? In a study published in August, 2013, Emily Cassidy and her team of researchers showed that the sole act of cutting meat consumption across the world would feed 10 billion people. That change may be too drastic to implement on global level, but even small dietary changes, such as choosing chicken and pork over beef, as well as reducing diary from our diet, would contribute towards the goal of feeding more people from all around the world. Crops have the potential to feed about 11 billion people, which is 4 billion above the current population on Earth. As the team of researchers from the University of Minnesota concluded, the problem with hunger would be solved if people exclusively directed production to food instead of using crops for biofuels and feed for animals. Due to the growing consumption of meat and the growth of the population, the demand for crops is expected to be doubled by 2050. Cassidy and her team found that only 55% of the calories from crops worldwide were a direct source of food for people. With the sole change of the way these crops are used, the agriculture on a global level could provide enough food for additional 4 billion people. This study should make us all think: where does our food come from? Are we wasting the potential of agriculture to feed the world by opting for fast food and satisfying meat dishes? My first thought after reading the results from that study was: "I have to stop eating meat. First of all, it comes from animals, which have to suffer for my tasty meal. However, it also comes from the suffering of people, who are experiencing hunger just because the rest of the population wants to eat meat." This is how much a single quarter-pound hamburger costs: 6.7 pounds of grains and forage, over 50 gallons of water for the animals and feed crops, over 70 feet of land, and over 1,000 BTUs for feed production and transport. The total consumption of meat in the USA is 270.7 pounds per person a year. When we think about the way our meat-eating culture is affecting the entire environment, the calculations are devastating. Unfortunately, the solution is much more complex than it initially seems. The fact that I am concerned about animals, but I still eat meat from time to time makes my vegan friends ready to criticize me whenever we start a conversation on food. However, there are few issues that add complexity to the issue: are people really 'designed' to be vegetarians? Can you tell an Eskimo that he's not supposed to eat meat? Without hunted meats, which are keeping their bodies warm and strong, Inuit people would not survive in their harsh surrounding. The fact that I have Vitamin B12 deficiency, which gets worse when I exclude meat from my diet, makes me doubt the claims that the vegan diet is the most suitable choice for everyone. Cereals, without a doubt, are one of the most important sources of food for humans. They contain all five important nutrients: water, proteins, minerals, carbohydrates, and fats. Meat, on the other hand, is an important source of protein, B vitamins, zinc, magnesium, and iron - all these nutrients are also necessary for proper development of people, and they are especially important during childhood. Associate Professor Felice Jacka, from Deakin's School of Medicine, found that women consuming less than the recommended amount of red meat were twice as likely to experience anxiety or depressive disorders as those women who consumed enough meat. Unlike in other parts of the world, where the cattle are fed grains and kept in feedlots, the cattle and sheep in Australia are grass-fed. When we choose to put meat on our table and we want a healthy option, we have to know where it's coming from. In February 2016, the British Journal of Nutrition published evidence that showed how organic production increased key nutrients in food. According to this research, organic meat and dairy products contain 50% more omega-3 fatty acids when compared to the usual, cheap meat we choose to eat. The difference in organic meat and dairy results from the way the animals are fed: organic meat comes from animals foraging on graces, which are rich in omega-3 fatty acids. When I compared the results from several studies, which are often contradictory to one another, I was more confused than ever. "Should I continue eating meat? Should I always opt for organic meat, dairy, fruits, and vegetables? How will my food choices affect my budget? How will they affect the environment? " Organic food, lactose intolerance, gluten allergies healthy food has become the mantra of our time. People are obsessed with healthy food to dramatic extents: the term orthorexia nervosa is not recognized as a clinical diagnosis, but it's no secret that the obsession with healthy food has led many people into an eating disorder. When people are too concerned with the nutritional value and origin of their food, they usually end up with malnutrition. A person who suffers from orthorexia makes sure to avoid potentially harmful foods, and always opts for pure, healthy foods. This system of values imposes a rigid lifestyle, so people always have to think about the meals they will eat, instead of spontaneously choosing food in response to the hunger their body signals. The media and healthy food industry support this lifestyle, capitalizing on the growing fear among people, who are ready to accept any advice that helps them improve their health, appearance, and self-perception. In consequence, people who are obsessed with healthy food lose contact with themselves, despite the external image of socially successful individuals. How concerned am I about the origin of the food I eat? I started eating less meat and more organic fruits and vegetables, although those choices started affecting my budget. However, I am not ready to go fully raw and join the vegetarian/vegan movements that are supposed to save the world. I do my best to eat the recommended servings of fruits and vegetables. That was the most important step I took when I decided to change my diet. Nevertheless, I haven't excluded meat, sugar, gluten, and other types of food considered to be unhealthy. I believe that humans have natural instincts. Our bodies give signs that we have to learn how to listen. If we overthink our food choices, we distance ourselves from the needs of our body and we try to train it differently. Although I am trying to be conscious about what I eat and where the food comes from, I would rather make an exception and eat a hamburger than to allow myself to turn food into an obsession.